The Club’s primary resource for fishing is Taunton Lake in Newtown, Connecticut. Fishing is restricted to members and their families with restricted access permitted for guests. Members can fish from the shore or launch a boat at the private boat ramp. Please not e that only electric motors are allowed to be used on the lake. Taunton is stocked six times each year with trout. NF&GC stocks only trout — Brown, Rainbow and Brook. 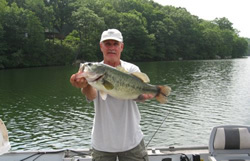 Large and Small mouth bass reproduce naturally in the lake as do other fish, including white and yellow perch, crappie, and sunfish. Members have even been known to catch a turtle or two! All members are invited to bring a guest or guests for our annual Member/Guest Tournament. Although the weather is unpredictable, the fun is not and all who attend have a great time. 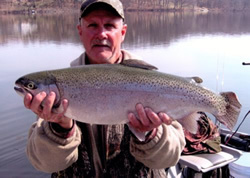 Cash prizes are generally awarded for the largest trout and bass caught every hour, and a separate pool is available for the largest fish of the day!! Take a look at some photos of successful participants below. Lunch is served at the pavilion and typically includes a charcoal grilled Steak, Corn on the Cob, Salads, Watermelon, Carrot Cake and plenty of cold drinks for the thirsty participants! If you haven’t joined us for this tournament in the past, you may want to make a mental note for next year. As stewards of Taunton Lake, Members should practice catch and release fishing whenever they do not intend to take their harvest. Catch and Release is at the discretion of the Member and there is nothing wrong with keeping your limit and preparing a wonderful trout meal. These guidelines are provided for members to consider when they intend to catch and release. While these tips are provided from the perspective of the trout fisherman, virtually all of these guidelines apply to other species as well. Air time is bad. One study by R.A. Ferguson and B.L. Tufts looked at the amount of time a fish is exposed to air after being caught and discovered that every second literally counts. Fish that were exercised but released without being held out of the water had a survival rate of 88 percent. But with 30 seconds air exposure that dropped to 62 percent and at one minute it was a mere 28 percent. 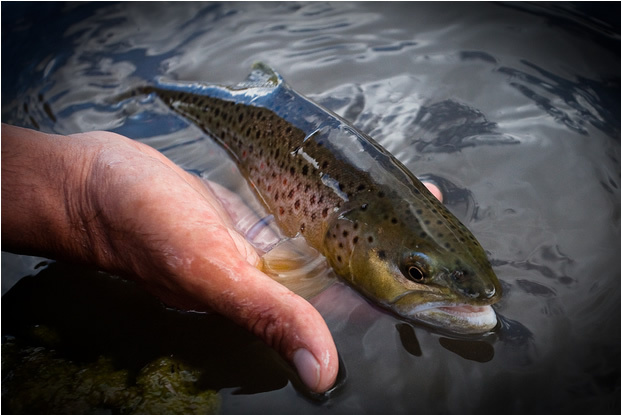 When releasing trout do not remove the trout from the water or use the newer rubber or trout friendly mesh nets. Use needle nose pliers or forceps to remove the hook from the trout’s lip. This causes minimal damage and gives the trout the highest probability for survival. If you see blood in the gills of any kind, it is unlikely the trout will survive. Providing a table to represent the survival rates for trout. Fish caught, exercised, placed in boat, handled and flops around 60 ???? Dead Fish? Keeping your fish in or near the water’s surface makes for excellent photos! Minimize or eliminate the time fish are out of the water. Don’t touch the fish if you can, try using forceps or needle nose pliers and release the fish while still in the water. We know that when a trout rubs around in a net, it can deplete the slime layer on its scales that help protect it from diseases. Keep your trout in the water or use a rubber net if available. Consider using only artificial lures – the use of baited hooks significantly increases the mortality of released fish. If you are bait fishing, set the hook quicker than normal, to prevent swallowing. Use circle hooks with bait. When a fish is deeply hooked, do not try to remove the hook – clip the line instead. Handle fish as little as possible and release them quickly – do not fight fish to exhaustion. Do not allow the fish to flop around on the ground or in your boat. When you release the fish, if it is lethargic gently move it back and forth forcing water into the fish gills. Pink or reddish spots inside blue halos. Wormlike markings on back. Fins along belly have distinct, white leading edge. End of upper jaw extends well past rear edge of eye. Tail fin square with few spots or none. Body color generally brownish/yellow. Dark and reddish/orange spots present. Pink or red band usually present on side of fish. Tail fin with many dark spots. Many small spots on body. Fish in lakes often silvery. Light spots on darker background. No red spots. Tail deeply forked.